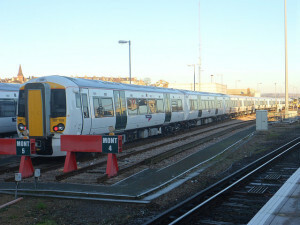 Suicides and signal problems have contributed to Thameslink’s service on the Brighton mainline being rated the worst in the country by passengers. Independent watchdog Passenger Focus asked 27,000 passengers what they thought of their most recent journey, and of those travelling by Southern and Thameslink, just 77% said they were satisfied with their journey – and Southeastern fared worst of all with 74%. This is eleven percentage points down on last year for Southeastern, two lower for Thameslink, but one more for Southern. However, when broken down to satisfaction by route, the Southern Sussex coast service fared better with 80% satisfied, whereas Thameslink scored just 63% -a significant drop from last year and the lowest in the country. Anthony Smith, chief executive of Passenger Focus, said: “Rail passengers’ satisfaction is driven by getting trains on time. Many are being let down – fare increases, billions in government investment and promises of improvement don’t seem to be delivering change on the ground. The high profile disruption after Christmas and at London Bridge will only have added to the gloom. The study did not include the Christmas period, when trains into London King’s Cross were seriously disrupted. Passengers have also suffered delays and cancellations since the start of this year because of signalling and other problems. Rail Maritime and Transport union general secretary Mick Cash said: “This report throws up yet more evidence that two decades of privatisation, fragmentation and under-investment on Britain’s railways have left passengers angry and frustrated as they see the hard cash they pay over for extortionate fares drained away in profits to the train operating companies. A spokesman for Govia Thameslink Railway, which operates Great Northern and Thameslink services, said: “This research was carried out in the autumn at the start of our new franchise. We’re disappointed by the 2% reduction in overall satisfaction which we are determined to turn around by giving our passengers a better service. “The punctuality of our trains is the single biggest driver in passenger satisfaction. Satisfaction scores went up on our Great Northern route, where we currently have 10% more trains arriving on time than last year. “However, on Thameslink, and in particular south of London, scores fell because, at the time of this survey, the route was hit by a series of significant delays. These were due a number of issues including signalling reliability on the heavily congested Brighton Main Line as well as seven suicides in the first three weeks, five of them on Thameslink and failed trains in the critical section of track in central London. “Since the time of this survey, and within only three months of taking over the franchise, we have introduced brand new trains on the Thameslink route but that is clearly not enough. We are also working closely with Network Rail and other industry partners on an action plan to improve reliability and service quality on the Brighton Main Line and Thameslink. Southern Deputy Managing Director David Scorey said: “Whilst it is encouraging that we scored better overall this year over last, we are still a long way off where we would like to be. “Clearly poor performance links heavily with overall satisfaction and that has produced a mediocre score. Unfortunately, the challenging constraints at London Bridge have played a major part in the challenge to deliver good performance but we are determined to do everything we can to improve our day to day punctuality. “Together with Network Rail we are working on an enhanced improvement plan to drive performance up. “On the bright side, there are some very encouraging scores in some of the key areas where we have been focusing our efforts to improve, such as better station facilities, improved on-train toilet availability, customer service and how our trains are presented. David Statham, managing director for Southeastern, said: “These disappointing scores show just how important a reliable and punctual service is to passengers. “We’re committed to improving performance through a robust new timetable, which has seen punctuality improve over the last two to three weeks; and a programme of investment in our trains. “We’re also working together with Network Rail to identify the areas for their multi-million pound investment scheme to target to deliver the greatest benefit to passengers. “We recognise that we have a lot more work to do to ensure that our passengers are more satisfied with the service that we provide. My senior team and I have been out and about around our network seeing first-hand how our service operates and listening to passengers’ concerns. “Over the next three years we’re investing more than £70 million in the things that our passengers tell us are important to them. “This investment will enable us to provide better information to our passengers, improve the interior and cleanliness of our trains, refresh the look of our stations and provide extra staff to deliver more face-to-face customer service.